In addition to the donations and dues we receive from the Citizen Police Academy graduates who join the Alumni Association, we hold various fundraising events. Our primary event is the Electronics and Paper Shredding Event. In 2007, the RCPAAA created the Electronics Recycling and Paper Shredding Event as a vehicle for the citizens of the area to rid themselves of the old electronic devices and to help prevent identity theft by safely shredding old documents and records. This event is held in the Spring (usually April) and Fall (usually October). Check our Calendar at http://www.rcpaaa.org/monthly-calendar/ for actual dates and additional instructions for the next event. The Spring event is held in conjunction with the City of Richardson’s Trash Bash and the Fall event operates as a standalone event. The upcoming 2019 spring event will be held on Saturday, April 13th from 9:00 AM until 1:00 PM at the Richardson Square Mall, located at the southeast corner of Belt Line and Plano Roads. Please enter the event on Belt Line Road. This event is being held in conjunction with the City of Richardson’s Annual Trash Bash. All types of electronics are accepted with the exception of the old “tube” style TVs and monitors. We cannot accept any hazardous material including fluorescent lightbulbs and batteries. Please remove paper from 3-ring binders prior to arriving at the event. Bring your paper and documents in plastic “grocery” bags or small boxes. Volunteers will remove them from your car. Paper will be shredded on site. The recycling and shredding services for a few boxes or bags are free to private citizens but contributions are encouraged. A fee of $5.00 / box is charged to businesses who would like to shred commercial quantities of documents. Please note that the RCPAAA offers this event as a fundraiser to help pay for our programs supporting the Richardson Police Department personnel and to help educate the community throughout the year. 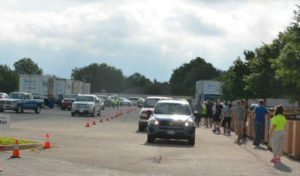 The RCPAAA contracts with the shredding company for the use of their trucks and employees. During the event’s first year, we only partially filled a single small truck. 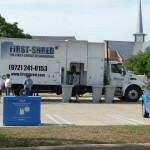 In recent events, we have filled five of their largest shredding trucks. This is a significant expense paid for by the RCPAAA (not the City of Richardson)! Please be generous with your donations. Since 2007, the Electronics Recycling and Paper Shredding and the City’s Trash Bash have both become very popular and grown in scope. The City of Richardson and the RCPAAA decided to expand the “footprint” of Trash Bash in 2015 outside the Civic Center parking lot. While there was an intermediate location, the RCPAAA Electronics Recycling and Paper Shredding have moved to the site of the “old” Richardson Square Mall, behind the Sears store. This also allowed the City of Richardson to enhance Trash Bash at the Civic Center while keeping the RCPAAA event as part of the festivities. This much larger space will allow faster drop-offs, shorter waiting times, and will also help prevent traffic backups on the public streets. 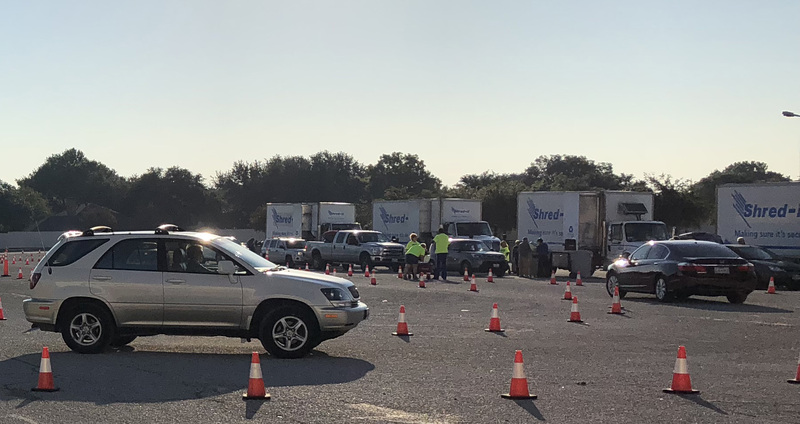 The net result of the RCPAAA Electronics Recycling and Paper Shredding Event is a cleaner Richardson, reduced waste in the landfill, increased protection from Identity Theft and more room in garages all over the area! Help is always needed. If you would like more information about how you can volunteer, please email events@rcpaaa.org.